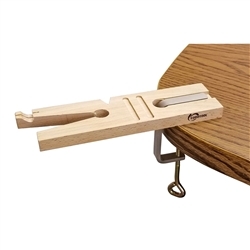 Finally a bench pin that will fit 99% of the tables that exist! This heavy duty c-clamp opens to a whopping 2.5″ to accommodate thick tables and benches. Sturdier than most, this c-clamp will not flex when pressure is applied to this fancy bench pin.